As promised, we're going to do a bit more 3D this week. Before we move onto full polygons next week, I'll take a bit of time to explain the basics behind horizontal spans. 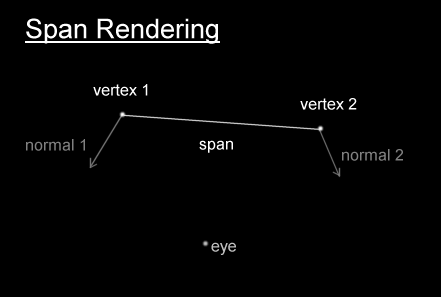 You will also learn about the most important part of software rendering, i.e. preventing overdraw. And finally, I will guide you through the design of this week's effect, just to illustrate how to make those critical decisions that lead to extra speed in the main loop. A span is basically a line of pixels, usually horizontal. Most primitive shapes like polygons or ellipses can be drawn as spans. All the pixels inside a span are written sequentially to the video memory, so we benefit from optimal cache performance. The simplest kind of span you can draw has only one colour, so no interpolation is needed. You could quite simply interpolate the colour components from one end of the span to the other: that's gouraud shading. Another approach is to apply a texture onto these spans, so you need to interpolate both your coordinates in the texture map. The nicer you want your spans to look, the more computation you require. That's the reason why most software rasterisers usually limit themselves to two mixed textures. The first texture being a static texture, and the second being some environment map. The coordinates for the static texture are always the same regardless of the view point. The texture coordinates for the environment map are computed given the normal vectors at each end of the span. The way we determine the coordinates in the environment is very similar to that I explained in the bump mapping tutorial. So for each pixel you must load both texels in question, and mix them together with a look-up table or an equivalent method. Software rasterisers being extremely expensive computationally, all unnecessary overdraw must be avoided. Using spans enables us to use some nifty techniques to prevent overdraw. There are two main methods. Firstly we can use the famous z-buffer, even though this is slightly more expensive in software due to cache thrashing, it is extremely simple to implement, and always produces the desired results. This shows a top down view of one row of pixels. 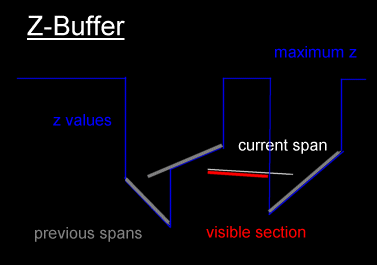 When we come to drawing the span, we check the depth value with the corresponding one in the z-buffer. If our span is in front, we draw it. The second method is ideal for software rendering, since it reduces the memory usage. 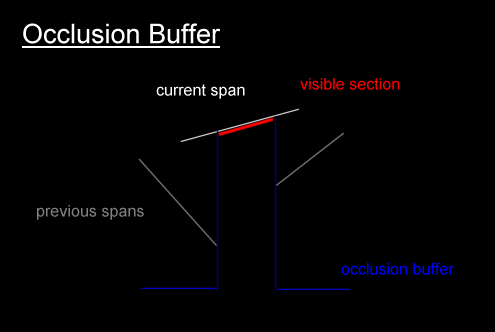 It's called an occlusion buffer. Basically for each row of pixels we store the coordinates of the spans we have previously rendered. Then when it comes to rendering another span, we clip that against the previously rendered spans, and only draw the visible parts. Once drawn, we update the occlusion buffer by merging all possible spans together, so that our list of occlusion spans remains the smallest possible. The only draw back of this method is that you need to sort your spans by depth before rendering them. It takes quite a bit of fine tuning to get a perfect effect running... don't think that most demomakers can code the perfect effect in one go ;) For example recoding this effect which I had already written in pascal a while back took me about 3 hours and a half. To give you an idea of how to simplify design to get more speed out of your algorithms, I'll guide you through the numerous steps it took for this effect. Note that I use a z-buffer in the example for simplicity. It's not really a good idea here, but I still get 70 FPS on my PII so I'm satisfied. The ideal way would involve an occlusion buffer similar to those used in voxel landscapes. The spans don't even need to be sorted since you can send them to the rendering pipeline in the right order just by knowing the rotation angle. I'll leave that to those of you that are interested.